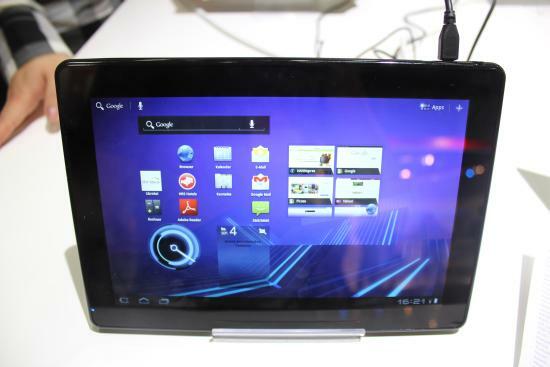 Tablet-News.net / Android / HannSpree HansPad SN10T4 Honeycomb Tablet Debuts at IFA! Often when we think of HannSpree we immediately associate them with cheap gadgets and at IFA Berlin they didn’t change our minds with the HansPad SN 10T4 slate with Honeycomb. From IFA video below you can see that HannSpree Hans Pad SN 10T4 fails to impress. It has a huge amount of lag time. It will arrive without much fanfare in early 2012 with a price tag between 300 to 400 Euros. The only thing separating HansPad’s Honeycomb model from its other is its TI OMAP 4430 processor instead of its normal Tegra 2 CPU processor. You’ll get the same processor if you purchase a BlackBerry PlayBook, in the dual core and GHz models. Another drawback of this tablet is that it does not pack the lightness and easiness to tot around that other tablets are offering. It includes many standard specs such as a 10.1 inch screen, 1280×800 display, Android 3.1 Honeycomb, front 2.0MP and 5.0MP rear cameras with 16GB of internal storage.